"An item that lets you carry up to 20 items." 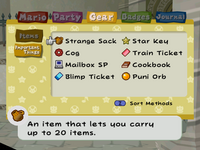 The sack permanently appears in Mario's Important Items list once obtained. The Strange Sack is a brown sack from Paper Mario: The Thousand-Year Door that allows Mario and friends to carry up to twenty items. It is found on the 50th floor of the Pit of 100 Trials. The sack increases the number of items Mario can hold from 10 to 20. This page was last edited on September 16, 2018, at 14:10.